I hate it when businesses advertise their Christianity. It usually means they’re planning to charge too much for too little. One time a dentist advertising himself as a Christian told my brother he needed a cavity filled. Later (after paying an arm and a leg for the procedure), it was discovered he didn’t ever have a cavity. My rule of thumb: if someone who is not a church mentions Jesus in his ad, stay far away. Your statement is too sweeping. I don’t doubt that some companies behave as you describe, but certainly not all do. 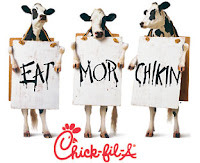 Also, does Chick-Fil-A “advertise” their Christianity, or just live it and now they have become known or it? this is so true. and now there actually i heart chic-fil-a bumperstickers! i am in seminary and i swear when i pull up to school, half the lot has them on their cars. how could you leave out In and Out? Chick-fil-A is in the south, in-n-out ain't. and just to be provocative (as if anyone'll read this), INO is WAY better than CFA. I mean, I love chick, but seriously, raise your hand if you always crave chick-fil-a on Sunday. Seriously. I have worked at Chick-fil-A (twice, once in high school, once in college) and it is an AMAZING company to work for! To be even more impressed with the company, read Truitt Cathy’s autobiography “Eat Mor Chikin: Inspire More People”. For example, Chick-fil-A has the resources to open several hundred stores a year. Instead, they choose to go slow, training operators and employees throughly, and open around 50 stores a year. In the age of evil corporate entities like Wal-Mart, Best Buy, and the government, having a truly Christian company like Chick-fil-A is inspiring, to say the least. How is Wal-mart evil. It has provided a good safe job for me for over 20 years, It has provided for me and my family while many companies are laying people off I still have a good job. I think you may not know what "evil" really is ! No list of evil companies is complete without IBM. I worked there for 5 years and HATED it. I have been a Christian for 30 years now, but my first visit to a Chick-fil-A was six weeks ago. I can’t believe I’ve missed out on this crucial bit of Christiandom. And I’m a PK too. You’d think I’d know better. I’m with “anonymous”, being West Coast born and raised: In-N-Out is amazing! Not only are their burgers of high quality, but they, like Chik-fil-A, have a very slow expansion process, even though opening a new store is a veritable news event. (The one that opened in Scottsdale had news helicopters, according to Wikipedia.) Instead of splurging on expansion and advertising, they pay above and beyond minimum wage to their employees. The small Bible citations (book, chapter and verse; never any text) are discreet and I actually didn’t even notice them until I was 16. Great company. My husband’s grandfather was Truett Cathy’s (founder of Chick-Fil-A) Sunday School teacher. On an unrelated note, my husband’s great aunt was Ruth Graham’s secretary. Chik-Fil-A has excellant food, and good business practices. They aren’t hypocrites. Yes, we love our “Christian Chicken”. I do not want to think about how much money I’ve spent at CFA. But it does help knowing their business style is one I am happy to support. Only a couple of years until my oldest can apply for a job there! Yeah for Veggie Tales & Adventures in Odyssey in the kids’ meals! give it up for christian fast food!! it doesn’t even matter that they’re closed on sunday.. their chicken is so dang’d tasty it must be a sin. sorry.. i’ll leave the witty writing to you. But seriously.. I’ve been loving the Chick-fil-A since before I could walk, I think (25+ years for sure) and only since the mid 90’s did I ever even realize they were a Christian company. If only I weren’t allergic to poultry (including Chicken). Given the desire for chic-fil-a on Sunday, perhaps it is like manna–On Sat we can buy extra and perhaps God will have it to keep until Sunday after church! I;ve been told time and time again that Chik-Fil-A is a Mormon company.. I used to attend the Baptist church Truett and most of his family have attended for many years.i can assure you he is not Mormon. 2nd the in-n-out prop. the slow expansion is due to that every franchise is family owned. but a generation is soon to be passing, and the young kids of that family is supposedly ready to get rich and start franchising to anyone. we’ll see if they keep their values… (worried). they pay their workers 9.50+ an hr. no fast food restaurant does that….hope they don’t stop doing that. the ad agency I work for handles the Chick-fil-a work and it’s amazing to hear our president talk about their values as a company. They just do it all right. Instead of forsaking whatever to get more $$$ as a company they almost forsake $$$ to do the right thing (quality of food, best employees, Sundays off, etc etc) and end up with the $$$ anyway. I heard something crazy like the average Chick-fil-a does almost 3x the amount of business per month that an average McD’s does, simply because Chick-fil-a doesn’t discount, they just do it all well and people don’t mind paying a little more for it.